The Phoenix Award is given to individuals who have made outstanding contributions to the Asian American Pacific Islander Queer Women and Transgender Community. We are honored this year to present the Phoenix Award to Trinity Ordoña and Desiree Thompson. Trinity A. Ordoña, the middle child of post-WWII Filipino immigrant family, has a 40-year history of civil rights activism in people of color communities. In the Asian and Pacific Islander lesbian, bisexual and transgendered people’s community, she has co-founded several local, national and international community organizations promoting identity, community and family reconciliation. Trinity received her Ph.D. based on her doctoral research, Coming Out Together: An Ethnohistory of the Asian and Pacific Islander Queer Women’s and Transgendered People’s Movement of San Francisco (2000) and now teaches teaches courses on history, culture, politics, social movements, sexuality, ethnicity, health and relationships as it relates to communities of color and APLBTQ people. Trinity has published widely and given numerous interviews, lectures, talks, workshops and seminars in community and academic venues across the U.S. and in Canada, Japan, India and the Philippines. Trinity is now an ordained minister and works with survivors of sexual violence, teaching self-healing meditation and facilitating access to non-discursive healing modalities from Western and Eastern healing traditions for underserved and marginalized racial, ethnic, and sexual minority populations. Last month, Trinity was named among the “20 Most Influential Lesbian Professors” by Curve, the premier national lesbian magazine. Trinity and her life partner, Desiree, have been happily married for 20 years. 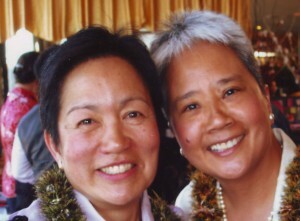 Born and raised in Honolulu, Hawaii of a sansei (3rd generation) mother and Native Hawaiian father, Desiree Anela Naomi Thompson came out as a lesbian when she was a Women’s Studies major in college in 1977. Her Houghtailing Street household in Kalihi was a popular hangout for “local” (born and raised in Hawaii) lesbians who gathered to play music, dance hula, and socialize away from the preying eyes of their families. Desiree met and fell in love with Trinity and moved to San Francisco 1987 and they have been happily married since 1988. Desiree has shared her personal and social experiences as an API lesbian in writings and interviews in Ceremonies of the Heart: Celebrating Lesbian Unions (1990), The Very Inside: An Anthology of Writing by Asian and Pacific Islander Lesbian and Bisexual Women (1994), and In Search of Gay America: Women and Men in a Time of Change (1989). Over the years, their 18th St. San Francisco house has been the welcome site for many local, national and international APLBTQ people who joined them for socials, meetings, fundraisers, weddings, anniversary celebrations and post-Gay Parade after-parties. Des is now looking forward to her retirement from the U.S. Post Office in 2010 after 30 years of service. Thank you Trinity and Desiree!